Revealing without being overly risque, strapless dresses are beautiful. However, the dress must fit you well or it will instantly lose its appeal. Bulges of extra fabric and wrinkling can ruin the effect of a strapless dress. With that said, do not panic if you realize right before an important event that your dress is too big. Fortunately, you can easily fix the size of the dress on your own. Put the dress on to get an idea of how much width you will need to take in to produce a good fit. Remove the dress and turn it inside out. Use your hand to fold the extra fabric at the left side seams to create the illusion of a well-fitting dress. Use pins to secure the folded fabric in place. Use a basting stitch to taper the excess fabric into the waistline. Turn the dress right side out and try it on. If the adjustment has produced a suitable fit, use a straight stitch to secure your alteration and prevent it from coming undone. Add extra padding to the bust of the dress or to your bra if the top does not fit properly. This is a quick, do-it-yourself solution that does not involve altering the seams at the bust. 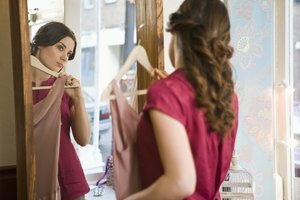 Can You Shorten a Floor-Length Dress?